Long, red, trumpet-shaped blossoms whorl around the end of stems. The leaves are oblong and come off stem opposite each other, though upper leaves may fuse together around stem. Climbing vine - blooms spring to fall. 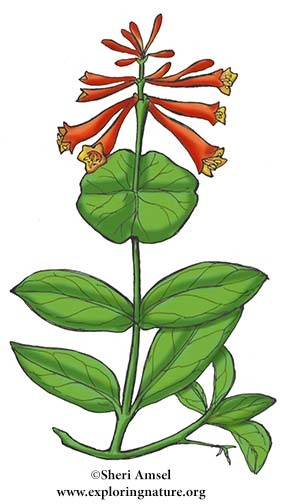 Also called Coral Honeysuckle.